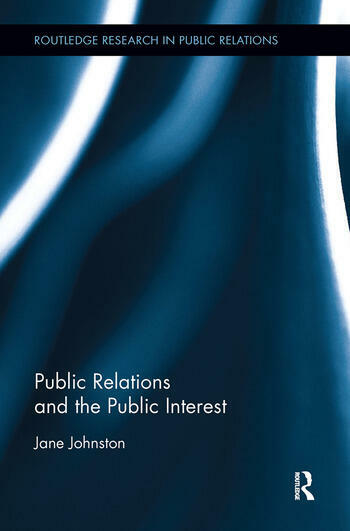 In this book, Johnston seeks to put the public interest onto the public relations ‘radar’, arguing the need for its clear articulation into mainstream public relations discourse. This book examines literature from a range of fields and disciplines to develop a clearer understanding of the concept, and then considers this within the theory and practice of public relations. The book’s themes include the role of language and discourse in establishing successful public interest PR and in perpetuating power imbalances; intersections between CSR, governance, law and the public interest; and how activism and social media have invigorated community control of the public interest. Chapters explore the role of the public interest, including cross-cultural and multicultural challenges, community and internal consultation, communication choices and listening to minorities and subaltern publics. Jane Johnston is Associate Professor, Public Relations and Communication at the University of Queensland, Australia. She has written and (co)edited several key texts including Public Relations: Theory and Practice and Media Relations: Issues and Strategies, both in several editions. Her diverse research interests include the intersection between justice, media and communication.